We joined up with Blackstone Audio to release most of our works in one big Boxed Set to make it easier to pick up all at once. 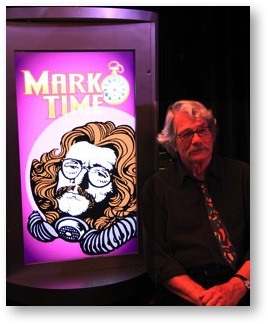 Here are 18 stories, including the live Mark Time Radio Shows, and our studio productions. And then there’s one CD with an interview Brian and Jerry did with Joe Bevilacqua, of Watterlogg Peroductions. It’s 10 hours of satiric science fiction and fantasy audio, suitable for all ages. Individual stories are available through Blackstone Audio as digital downloads for purchase or for rent at their Downpour source. The Boxed Set may be purchased as digital download, or as Audio Compact Discs or MP3 disc. I’ve had many happy opportunities to be my Old Time Radio Hero, George Tirebiter, in his own comedic identities as a Vice Presidential candidate or self-styled private eye, for example. Fewer chances have come George’s (or my) way to perform as a radio character actor, like those great voices still murmuring their lines back in my memory tubes. The best of these acting chances, thanks to the partnership of Jerry Stearns and Brian Price, were the annual performances given as part of the Mark Time Awards. They gave me the chance to work live on stage before an increasingly expectant audience, and with an extraordinary team of talents that met only once a year to bring the show on home. 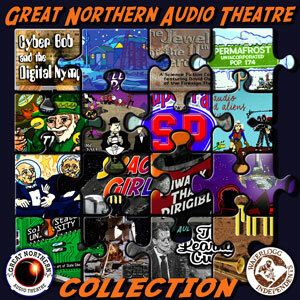 The Great Northern Audio Theatre Collection preserves 18 audio comedies in one Box, including a dozen featuring Phil Proctor and Melinda Peterson, yours truly and many talented guests. Hours of wonderfully written science-fiction fun, performed live, just like the old days. Tune in! Track listing for the CDs. Blackstone publishes mostly audiobooks, so they have broken up all our half-hour stories into 3-4 minute tracks, to make it easier to get back to where you stopped before. Below is a listing of what tracks comprise which tales on which discs. Note: Some stories conclude in the middle of a track and the next story begins with no break. Joe Bev interviews Jerry Stearns and Brian Price.